Thanks so much to reader Megan, who commented on this Cuisinart deal to share that Amazon dropped the price on this Cuisinart Frozen Yogurt, Ice Cream and Sorbet maker after Tanga put it on sale! for as low as $56.98. That's 48% off the list price of $110, and shipping is FREE, too! 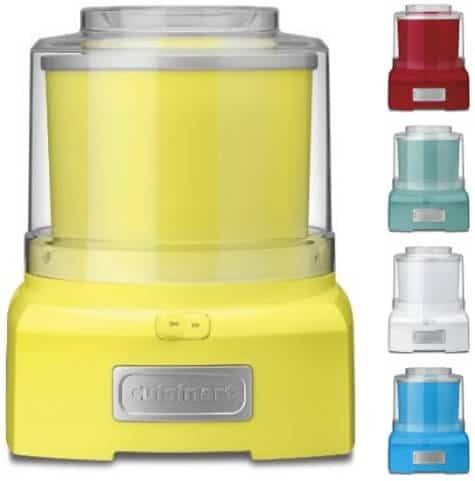 While the previous deal was only on the red froyo maker, Amazon has a bunch of colors available and they're all at least 41% off the regular price and they all ship FREE! If you do give one of these great machines as a gift, an ice cream cookbook is the perfect companion to this little appliance. I actually have one of these ice cream makers–it works brilliantly and I LOVE it, but I keep thinking an Ice Cream, Gelato and/or Sorbet cookbook would be fantastic to have in my kitchen.